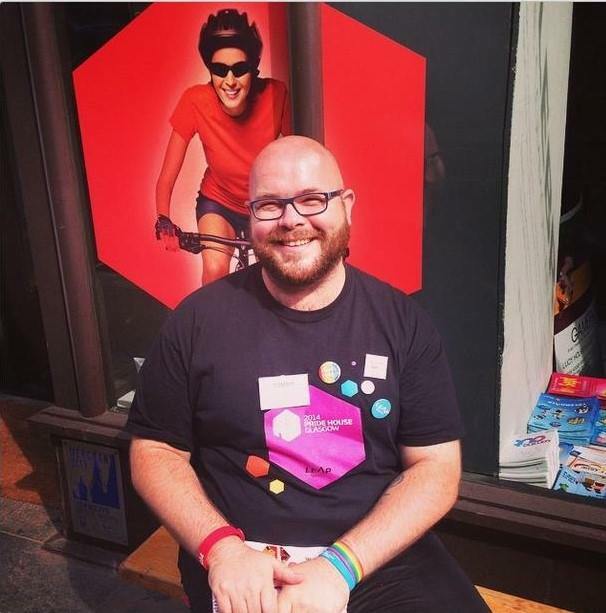 Tommy was first inspired to sign up as a volunteer for the Pride House Glasgow project which run during the Commonwealth Games in Glasgow 2014. In Pride House, volunteers worked in different teams and Tommy was part of the ‘Welcome’ team. Tommy has an excellent rapport with the general public and became renowned for convincing passers-by to come in and see the project. This was borne out again in our evaluation where Tommy was personally named by many visitors. We subsequently invited Tommy to get involved on an ongoing basis and he has been a stalwart of the team ever since. A key highlight last year was when we nominated Tommy for ‘Volunteer Icon of the Year’ at the first ever Scottish LGBT Icon awards. Tommy was shortlisted for the award and was announced as the winner in a ceremony in Glasgow last November. We spoke to Tommy about his volunteering experience and here’s what he had to tell us. I get a deep satisfaction that I have been able to help someone with an issue. Whether that is giving directions, welcoming people to Pride House, or helping a non-English speaking gymnastic team fix their insurance and food worries. There is a special buzz, a feeling that you get deep inside, kinda like if you’ve done a good deed for someone. Some of my favourite moments volunteering include doing the Gay 5K and not coming last. I also enjoyed dressing up in drag and going completely over the top to bucket rattle outside the Kings Theatre for the Rocky Horror Picture Show. I loved all of Pride House and being part of the whole experience. The whole atmosphere and experience of the Commonwealth Games was wonderful. I even met an athlete who let me wear her silver medal for a picture opportunity. Recently at the EGLSF event, I offered to take one delegate for a history tour and ending up with eight. I enjoyed talking about history and being the little tour guide, I enjoyed the social events and talking to the delegates. I see myself as a volunteer who has a number of different skills or experiences which LEAP Sports have been able to use over the past couple of years. I think that my manner with people and how they respond to me has been building over recent events. This only helps build friendships and bonds with people which can help with relationships for future events. Many from the EGLSF weekend claimed that this was the best assembly weekend they had ever experienced to date and I like to think that I was part of making that happen in some small way as part of the volunteer team. I would recommend everyone should try volunteering for something, there’s plenty out there. Like me, they might find they develop new skills, and experience feeling that buzz and sense of satisfaction. Tommy is a brilliant ambassador for the work which LEAP Sports does. His participation helps to not only deliver our projects and programmes, but greatly contributes to the increased equality and community cohesion we aim towards. Volunteers like Tommy are very important to our work as they represent the community spirit which characterises the LGBTI community in Scotland.